Prompted by Spot’s near-miss (http://www.theultralighthiker.com/spot/), I have been working on a JR-Proof fence (I know you will say, Good Luck with That!’, but I am an optimist. This section has him stymied at least. The electronic gate controller also has the local ‘tea-leaves’ in somewhat of a quandary. We used to have some low-life drive right up to the house about once a week, yet when we opened the door, they would scuttle off – or if we had them trapped, they would give some preposterous story about searching earnestly for someone who never existed. 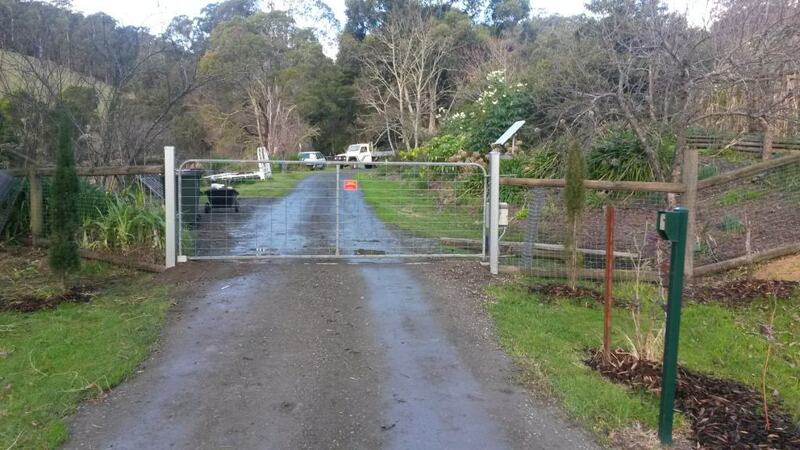 In the years since we installed the push-button gate there have been None! It will soon have a sign saying, ‘For entry ring this number——‘ and a digital keypad so you can let yourself in with a code if you haven’t got a remote – after you have rung when we are not at home –when we would let you in with a button at the house once we knew who you were, eg at night. I also plan to install a wireless security camera powered by the gate batteries. I might need to upgrade the batteries &/or the solar panels to provide it with current 24/7 but it will then keep a video record of whoever walks or drives up to the gate. This should be a great extra deterrent against black hats. A number of folk make these gate units. We bought ours from these people. It has been working fine now for quite some time; the batteries need charging once in mid-winter because the solar panel is too shaded by a large blackwood – I should move one of them: http://www.solartronics.com.au//?file=home This company offers excellent value and service, and especially after-sales service if you have any hassles.